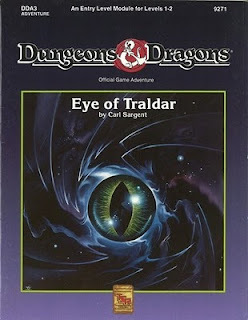 Some of my players and I played some of The Eye of Traldar this past weekend and it got me thinking. 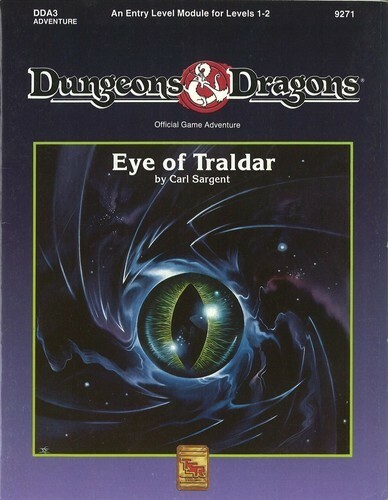 The Eye of Traldar is one of the rarer modules for "Basic" Dungeons & Dragons. It was written as a part of their "Challenger" series of introductory modules that expanded the Troy Denning boxed set. The story behind the module is relatively straightforward. The Iron Ring, a nefarious band of slavers under the leadership of Baron Ludwig von Hendriks, has acquired a potent magic item called the Eye of Traldar and brought it into their stronghold of Fort Doom. The Baron and his chief magical advisor are currently patrolling the borders of the Barony and evaluating the military strengths of their neighbors. Should the Baron and his advisor return to the Fort and discover how to unleash the power of the Eye, the Baron will be able to increase his domain and subjugate entire populations to his will with the mind coercing powers of the Eye. It is up to our stalwart band of adventurers to infiltrate Fort Doom, through its "underdungeons," and retrieve the Eye before that can happen. It sounds like exciting -- if standard -- stuff, and it is...after the first act full on narrative railroading has passed. Carl Sargent has presented a perfectly entertaining scenario, but it suffers from two key flaws. The first flaw is in the presentation of the narrative. The second flaw is a common "flaw" in "Basic" Dungeons & Dragons itself, and is what gave rise to this post in the first place. In an attempt to start the adventure in medias res, Sargent begins the module with the players encountering a man named Alexei who is fleeing the Iron Ring. Within seconds of Alexei's arrival in their camp, the Iron Ring arrives. The encounter clearly establishes who the good guys and the bad guys are, and quickly involves the PCs in the dangerous business of combat related "action" (more on this in flaw 2). After the encounter is complete though, the adventure provides no opportunity for the players to abandon the rest of the quest. They are forced from encounter to encounter, with no options to decline to aid Alexei. It is possible for a DM to "wing it" and have the necessary encounters happen as a result of them not helping Alexei, but even then the players will feel railroaded into a forced narrative. Essentially, the players must endure three ambuscades before they begin their quest proper -- whether they want to or not. Given the difficulty of the first encounter, I think many groups might decide that abandoning the life of adventure is the higher calling. 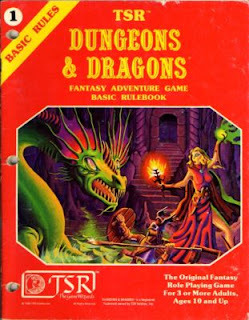 Which brings me to what I view is the adventure's second flaw -- and a flaw in "Basic" Dungeons & Dragons -- its shear lethality. Let's take the first encounter as an example. The players meet a 2nd level Fighter named Alexei and must face his pursuers which include 3 1st Level Fighters, 2 1st Level Thieves, and a 1st Level Elf (a fighter/magic-user hybrid in "Basic"). Let's assume a typical party of a 1st Level Cleric, a 1st Level Magic User, a 1st Level Thief, and 2 1st Level Fighters -- this wasn't the make up of the group playing. My group had a Cleric, a Fighter, and a Magic User. A quick look at these charts, as well as a basic understanding of D&D, reveals that the average "Opponent" Fighter has the following chances to hit the Average party. As you can see, the average "non-Fighter" 1st Level character dies the first time that they are hit and Fighters are killed on the second hit. This is modified by the percentage chance to be hit. If we look at it as a Damage Per Round Equation (DPR = %toHit*AvgDam), we can determine the average number of rounds of combat a particular character will survive at First Level. This demonstrates a couple of things. While your average Fighter can only take 2 hits before being killed, he is still likely to last 6 rounds due to his low likelihood of being hit. Clerics are also have a fair chance of staying around for a while in a fight. Magic Users and Thieves, on the other hand, drop like flies. Which brings my to my group on Saturday. It consisted of a Cleric, a Fighter, and a Magic User. The module specifically states that the Elf aims at any non-armored individuals with his Longbow. In this particular case, he had a 60% chance of hitting the Mage and his average damage was enough to kill the Mage outright -- and that's what happened. For some, the fragility of low level characters isn't a problem. 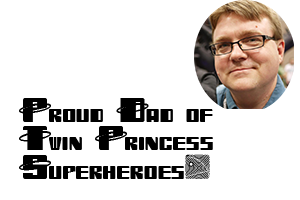 For them, the lethality of "Basic" D&D is one of its charms. I am not one of these people. I love the simplicity of the "Basic" system, but I also like to have my characters feel heroic. For me role playing games are about telling a story and having fun. Having your character killed in the first round of combat might be fun for some people, but it wasn't fun for my player. I had rolled the damage in "public view" and couldn't fudge the damage done, so this led me to institute one of my old house rules -- a house rule that I believe vital to "Basic." One of the things that led me to instituting this house rule was that some of the most "lethal" role playing games, Warhammer Fantasy and Dragon Warriors come quickly to mind, have systems that do not allow for low level characters to be "one hit killed." Instead they have "Fate Points" which can be spent to avoid death, or starting hit point totals that are greater than a single blow can deal in damage. I don't mind players being incapacitated, so both of these are out. What I have ruled is that when I am running a "Basic" game, no character dies until the end of an encounter. If you are at zero or fewer hit points at the end of a combat, then you are dead. If you are healed before the last opponent is defeated/flees, then you can participate until you are incapacitated again. Given that the only way to heal a character in "Basic" is with magic items or spells, this isn't too "forgiving" of a rule, but it did allow our party to treat the mage's wound with a potion of healing and kept the player involved. This isn't a rule that I used last night, but it is one that I am considering using. Given the fragility of "Basic" characters, it might be nice to give them a chance to automatically take zero damage from the first attack that hits them. Each player essentially has one "ablative" hit that cancels the first time they are struck in combat. This way players can feel heroic, after all they survived the first hit against them this combat, without being too powerful. This has the added effect of having diminishing value as the characters go higher in level. Higher level creatures tend to have more attacks and PCs have higher hit points so giving an additional hit doesn't alter the fear of death too much. Since Fighters, Clerics, and similar Classes are so hard to hit in the first place, I might limit this to just Magic Users. It could be a class feature called "protective ward" or some such. Since Magic Users have such a low survivability rate at low levels, this seems a natural addition. Mind you, if your group doesn't have a problem with one hit kills and finds that challenge rewarding than these rules aren't for you. I will be using them with my group though. I like the rules that you have implemented, especially the first one. There should logically be an intermediate state in between life and death and using 0 health as being unconscious. By waiting until the end of an encounter for death to occur, you give the other players a chance to decide to save the fallen friend, or leave them to their own fate. Very clever. My recommendation is to give 1st level characters a one-time hp bonus at creation. Divide their CON score by 2, and round fractions up. This is added to your initial HD roll. This way, the average character gets a boost of 5-6 extra hp, so most characters can take 1 or 2 hits without dying. Since it is a modest, one-time bonus, it doesn't really affect the higher levels. 1) The traditional counter to high attrition at low levels is to run multiple characters. Found your blog by this post: I was just testing this adventure in order to compare basic D&D with 4ed.